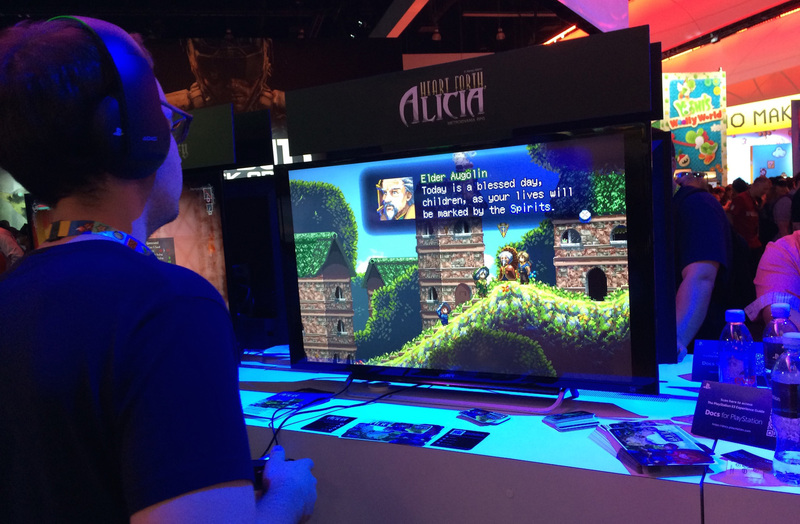 So Heart Forth, Alicia went to E3! We got to show the game to dozens of people each day, several of whom—to my surprise— where backers of Heart Forth, Alicia! I had a chance to get to know each one and personally thank each one for backing the project. As for the general crowd, it was very rewarding that everyone I saw playing the game at E3 loved it and were very excited for the full release; those who already knew about the game felt like it lived up to their expectations, so I couldn’t have asked for more. After watching so many people play the game, a couple of things that need some tweaking became noticeable. The most important one was the HUD: to some people it was confusing to understand the HP & SP representations, so I’ve added its redesign to my list of to-dos. I’ve actually waited a long time for an excuse to change it. I learned from GDC that there’s no way to run a kiosk for 3 days entirely on your own. So in came Kumar Jerath, one of our backers who’s been involved with the project for a while. He offered to come to E3 with me and help with some of the work, so big thanks to him! <3 Unfortunately, there’s no way you can both staff a kiosk and get to enjoy the event for what it is & play all the awesome stuff being showcased, but I was nonetheless very proud for HFA and its team for being a part of E3! Very thankful to the guys at PlayStation for making that happen. There were plenty of things learned, but going to E3 proved to be a great opportunity for the game, so I’m happy we were able to take advantage of it. With that said, it’s time to go back into the cave to fully concentrate on development. There’s still a long road ahead of us, but it makes all the difference to know we’re heading in the right direction and that people like the game. We’ll keep you updated as we move forward!